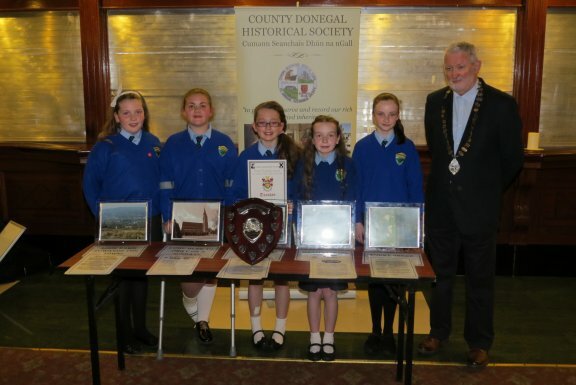 Edeninfagh N.S., Glenties The winners of the Harley McDonagh Trophy, Edeninfagh N.S, Glenties pictured with Dr. Lochlann McGill, President , County Donegal Historical Society. A collection of photographs from the Glenties area inspired by the life of local resident, Annie McGlynn. Inver N.S. Winners of the Emerson Award, Inver N.S. with Teacher Emma Johnston and Dr. Lochlann McGill. An excellent collection of photographs from the Inver area showing structures such as the Martello tower, the coastguard station and Cathleen Wilson’s thatched cottage. They also featured their own school which is a listed building. It has a distinctly Chinese influence in design mainly due to the input of Mrs. Montgomery Stewart of Drumbeg House, who had spent some time in China. 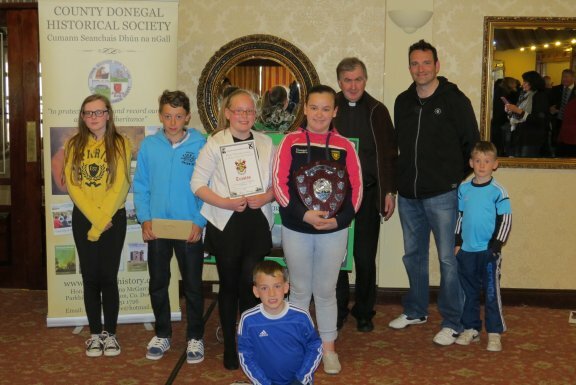 Rockfield N.S., Ballyshannon Winners of the Fr. 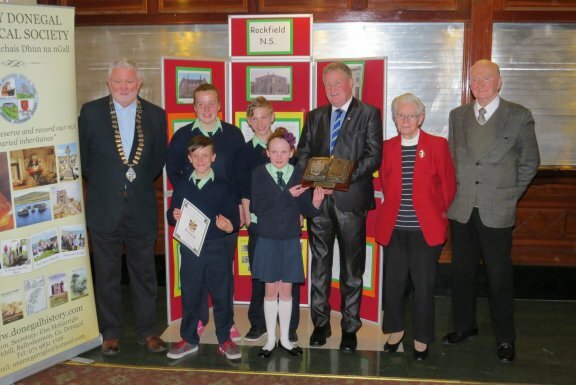 Jackie Fitzgerald Memorial Trophy, Rockfield N.S. with John McCready representing the Fitzgerald Trust and Fr. Fitzgerald’s sister May with husband Brian. A photographic history of many of the classic buildings in Ballyshannon, such as the Sheil Hospital, Epworth House on the mall and the famine village. Carrick V.S. 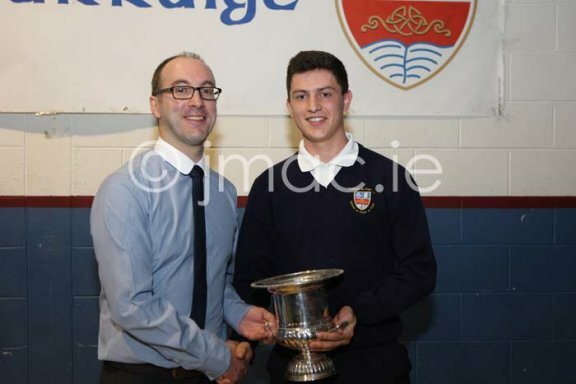 Winner of the Donal O Lochlainn trophy, Christopher Byrne being presented with his award by Simon Waugh, History teacher, Carrick V.S. A collection of artefacts created by the Woodwork department under the guidance of teacher, Noel Ward. Some really nice pieces including creels, beehives and a harp. The winning piece was a recreation of a Martello tower by Christopher Byrne. 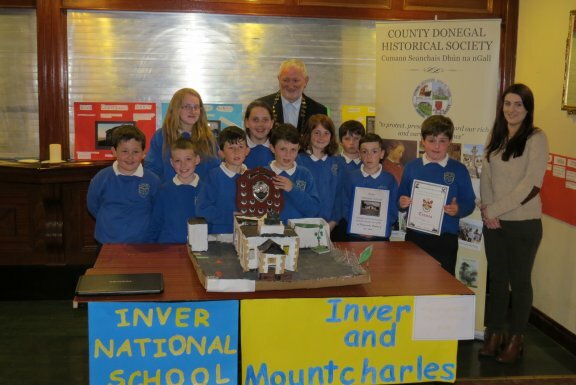 Scoil Phadraig, Dobhar Students from Scoil Phadraig, Dobhar with teacher Colm Ferriter and society President, Dr. Lochlann McGill. A selection of interesting photographs from the area showing churches, graveyards, beautiful scenery and wildlife. Gleneely N.S. 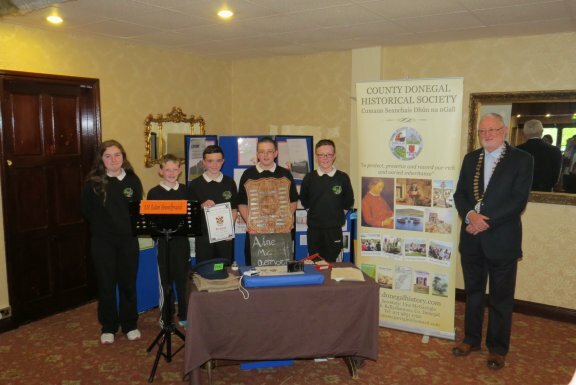 Pupils from Gleneely N.S., Killygordon with society President, Dr. Lochlann McGill. An excellent depiction of the social and economic life of the Killygordon area with some excellent photgraphs of St. Patrick’s church and the Mantis Crane factory, among others.